The monastic district of Cloyne became the Diocese of Cloyne under the new arrangement of the Synod of Kells in 1152 A.D. The boundaries of each Diocese were drawn at Kells and it then became necessary to establish the exact boundaries of each parish. The parishes of Ireland were assessed for a Papal Taxation in 1291 A.D. and as a result an almost complete list of the parishes of the Diocese of Cloyne is available, dating from that time. At present there are forty six parishes, many of which are unions of smaller ancient parishes. They are grouped into five deaneries. 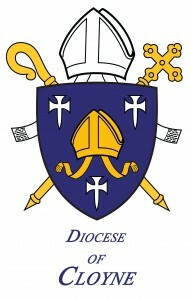 The Dioceses of Cork and Cloyne, were united, under Bishop Jordan Purcell, by Papal Decree in 1429. When a vacancy occurred in 1747 they were separated and bishops appointed to both dioceses. Bishop John O’Brien was appointed to Cloyne and was also given responsibility for the Diocese of Ross. Ross was separated from Cloyne in 1850. The 19th and 20th centuries witnessed great progress, with convents, monasteries and schools being founded in many parishes. Numerous priests, religious men and women went to work in all five continents. The great age of Church building dawned shortly before 1800 A.D. St. Mary’s Church, Youghal was built in 1796, and gradually new parish churches were built in every parish in the Diocese. In 2001 there were 131 Primary Schools with 15138 pupils and 32 Second Level Colleges catering for 11641 students in the Diocese. The ruins of churches and monasteries, the holy wells and Mass rocks to be found throughout the diocese are a testimony to the faith and devotion of the people through the centuries. Religion and devotion flourished and missionary activity continued under the pastoral care and guidance of Bishop J. McCarthy 1874-1893; Bishop R. Browne 1894-1935, Bishop J.J. Roche 1935-1956, Bishop J.J. Ahern 1957-1987; Bishop J. Magee 1987-2010; and Bishop W. Crean 2013-present. Today, The Diocese of Cloyne has a Catholic population of over 150,000 people. It stretches over most of the county of Cork, with the exception of the city and West Cork. Its 46 parishes run from Mitchelstown in the north-east to Rockchapel in the north-west, from Macroom in the south-west to Youghal in the south-east.